I love shortbread! I think it could be tied with snickerdoodles for my favorite cookie. So, when I saw this cookie in the December issue of Bon Appetit, it went on my list for this year's holiday cookies. This is a super easy cookie to prepare & the results will make a pretty addition to the holiday cookie tray. Matt & I both really liked the flavor & he commented that he liked the fact they weren't overly sweet (I think the bittersweet chocolate helps with that). I made a few tweeks to the original recipe. First of all I increased it by 50% because my baking pans are bigger than what they called for. Next, I melted my chocolate before putting it on the hot shortbread, they say the heat from the cookies will melt the chocolate but I didn't really trust that. I asked Matt to crush the peppermint candies for me. He put them in a food processor & ended up making more of a peppermint powder instead of chunks, I actually think it looks really pretty & sparkly. Finally, they swirled white chocolate all over everything & I didn't think it needed that. Spray a 12" x 16" baking sheet with sides with cooking spray. Line with a piece of parchment paper that hangs over the edges. In a mixer beat the butter until creamy, about 2 minutes. Slow add the sugar and beat until light & fluffy about 3 minutes. Beat in the vanilla and egg. Mix the flour & salt together. Gradually add to the batter, mixing on low until just incorporated. Spread the batter out evenly in the prepared baking sheet. Prick all over with a fork. Bake for 25 - 30 minutes until golden brown. While the cookies are baking melt the chocolate in a double boiler or in the microwave. Put the peppermint candies in a food processor & process until they reach a sugar like consistency. To freeze these cookies, layer them in a plastic container with wax paper between the layers. I keeping thinking I've got a plan all set for what to make for my cookie exchange and then here comes another great one! I'm a huge shortbread fan. These are so pretty! whoa. I would love 5 of these right now with my hot coffee. 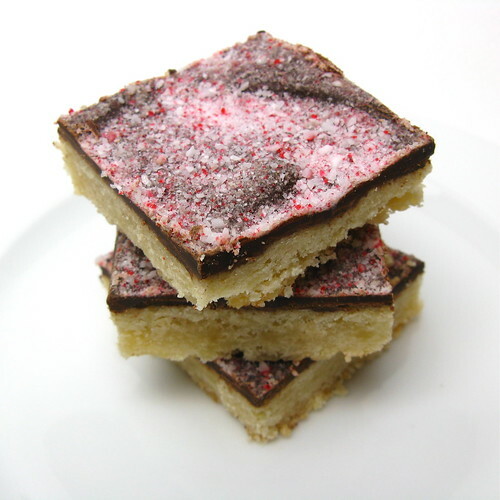 this could very well be the finest version of shortbread i've ever seen. there's just something about the chocolate-mint combo that i find completely irresistible. I am adding these to my holiday bake list! So pretty! This is one to try! These really do look irresistable! Great choice! Chocolate, peppermint and shortbread.....please share these treats with me!! I made the Bon Appetit Peppermint Chocolate cake that they had on their cover last winter. It was divine!! Gonna do a redo this year. Yum! This looks so fun and festive! 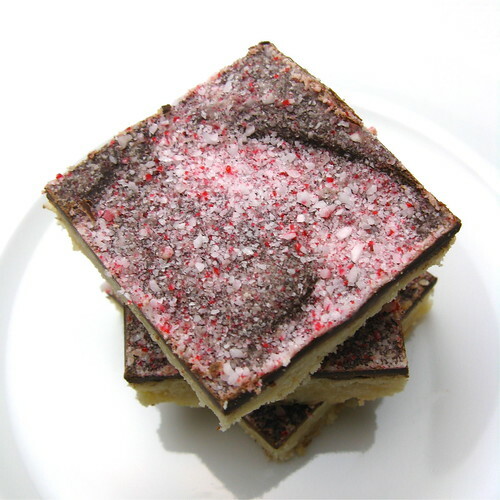 I adore peppermint bark, so I'm imagining it tastes similar.